The silver marks most widely forged marks are generally those which have the potential for the greatest increase in value. One of the most commonly forged mark is "Tiffany". 1. Always look at the object first before looking at any hallmarks. Is it the right shape or style for the period? 2. The best way to catch these carefully prepared forgeries is a side-by-side comparison. Compare the mark of a suspected piece to genuine marks in reference books or known originals in your own collection. 3. Larger marks with several lines or large symbols, could be struck by hand or a machine press. Most marks on silver plate, regardless of the size of the mark, were mostly struck by machine presses because the base metal was heavier and stronger than solid silver. Buyer or investor need to be careful when buying Antique Silver. Reader may post on Forum or Contact Us if there is any questions. Silver is our passion. We will always try our best to help. Any cast or molded mark is suspicious. Virtually without exception, authentic marks on vintage silver and silver plate were stamped, not cast. Reproductions, particularly new silver plate, are generally cast in molds. Since new molds are usually made by copying originals, marks on originals are usually transferred to the new molds. Cast marks are almost always blurred with impressions of uneven depth. 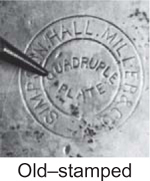 Stamped marks are generally much cleaner and sharper than cast marks. Any standard mark that includes 925 is suspicious. All 925 marks, whether standing alone or combined with other symbols as the above example, are very nearly a guarantee of a reproduction. 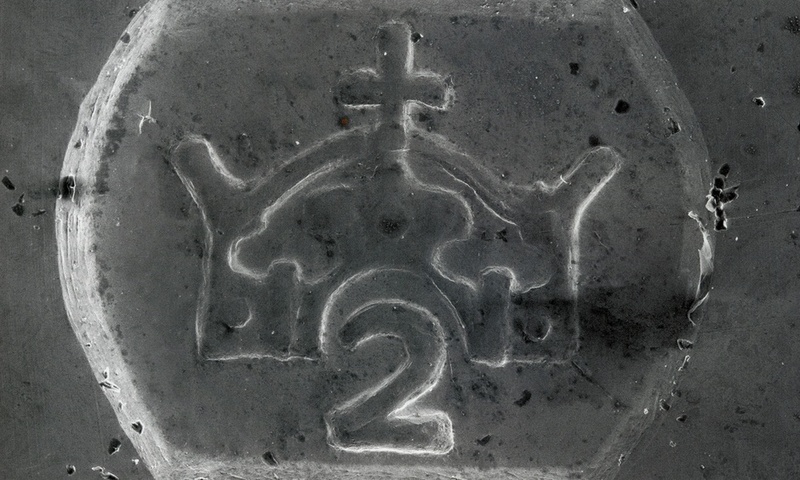 The 925 standard mark was very rarely used in vintage American silver. It was not widely used until the European Community (EC) adopted it in the mid-1970s. Any mark that is exceptionally small is suspicious. The 925 standard mark above is smaller than the diameter of the lead in the wooden pencil shown for comparison. Any mark under one-sixteenth of an inch is suspect.